Yesterday, the fiscal note for the latest version of voter photo ID legislation was posted to the North Carolina General Assembly website. 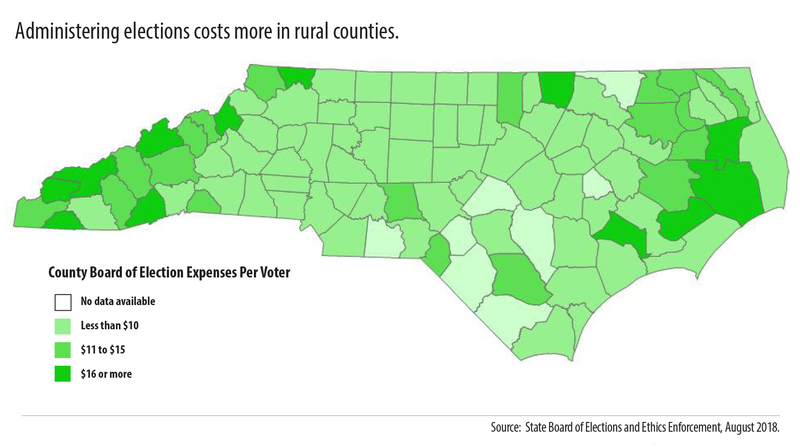 The memo is only able to address some of the costs that this new barrier to voting will create, and even this partial accounting shows that it will cost North Carolina millions to solve a non-existent problem. If experiences in other states are any guide, the real cost to governments and citizens is likely to be much higher, and will divert resources from addressing real barriers facing the voting public. 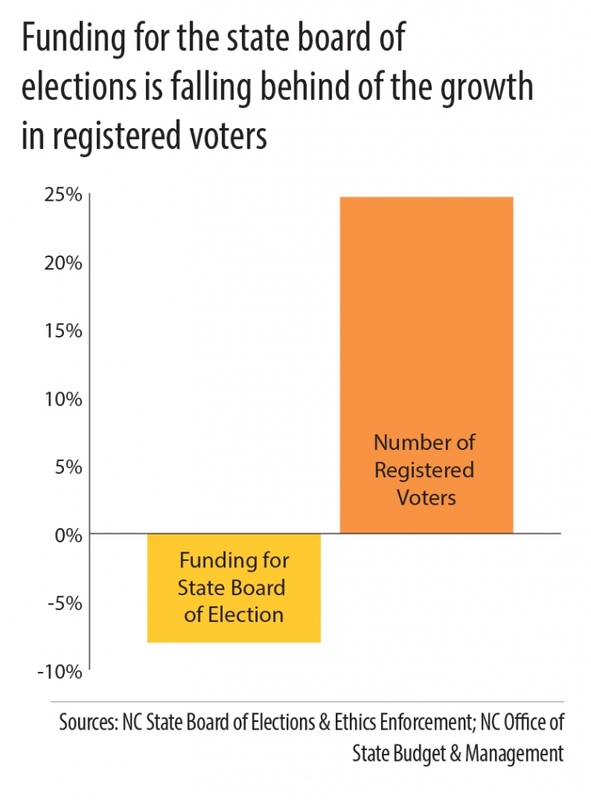 The total official estimates for the cost to state taxpayers of erecting new barriers to voting is between $4 million and $3 million annually, assuming that only 3 new state employees can successfully educate all of our local board about one of the most complex changes to our election process in state history, with no estimate for local Boards of Election charged with the majority of implementation, plus the loss of $3 million annually to the Department of Motor Vehicles for processing and providing identification without a fee. The memo also does not address many of the costs to local governments and Boards of Elections, litigation costs that will almost certainly arise from legal challenges to this legislation, meaning that the real cost to taxpayers is likely to be substantially higher. These conservative estimates from the Fiscal Research Division are consistent with partial cost estimates produced by the NC Budget & Tax Center in September. Based on experiences in other states and data obtained on the number of North Carolinians who may require new forms of identification, the direct cost of implementation could easily be $9 million. Adding another $3 million in costs to defend this law against legal challenges, and the total cost to state and local governments could reach $12 million. There is good reason to believe that the real costs to state and local taxpayers will be even higher than either of these recent estimates indicate. Several costly features of the current legislation are extremely difficult to estimate accurately, including: the printing and processing of provisional ballots, the maintenance and administration of the law by county Boards of Election, the administration of providing information to the public about the photo ID requirement, and the potential legal requirement to provide no fee supporting documents for those without identification to secure one. Finally, the memo also cannot fully address the potential for election-day problems once the photo ID requirement is implemented, and the additional costs that could fall on voters and local boards of elections. Examining IDs will almost certainly mean that it takes longer for each North Carolinian to cast their ballot. Moreover, the current legislation does not set aside nearly enough funds to appropriately educate the public about such an important change in how we access our right to vote, so there is likely to be significant confusion once North Carolinians arrive at the polls. As a result, we’re likely to face longer lines at the polls, local elections boards will be compelled to hire more staff, or both. Already funding to the state Board of Election has fallen behind the growth in the number of registered voters. The NC State Board of Elections budget for election administration, not including campaign finance administration, has decreased by 8 percent between the 2006 and 2017 fiscal years; meanwhile, the number of registered voters in North Carolina has increased by 24.7 percent during the same period. Moreover, given the reliance on local County Board of Elections to administer the law, there is likely a significant investment that will be needed by local governments to support the ongoing maintenance of equipment, hiring of staff and provision of supplemental education efforts. As our analysis found this Fall, funding for county Board of Election operations varies considerably across the state with rural counties investing far fewer dollars in the administration of their elections per voter. An appropriation to ensure that counties aren’t left with additional costs from an unfunded state mandate should be estimated. The bottom-line is that even with the cost at $7 million to implement these new barriers, the state will be erecting barriers to vote for poor whites, Black and brown voters across the state, many of whom live in rural communities. 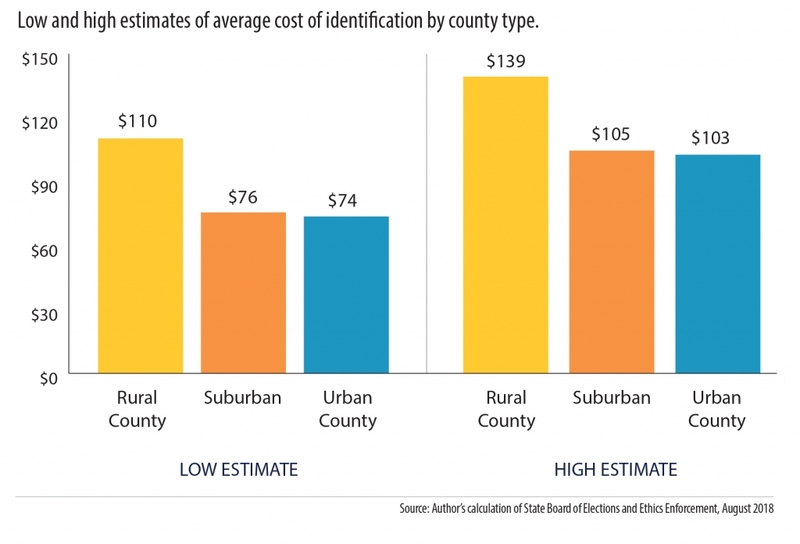 Even with a no-cost ID card available, there are still costs to individuals of obtaining identification to vote that put a squeeze on the budgets of those living in poverty or with fixed incomes. These costs include the cost of supporting documentation, travel times to DMVs and wait times at DMVs. Our estimates find that the cost of an identification could range from an average of $86 to $115 in North Carolina, and up to $139 in some rural counties. Instead of spending money to make it harder to vote, North Carolina could be using those funds to address the real threats to our electoral system. Millions of dollars a year could go a long way toward the security of our election systems, fixing and updating aging election equipment, addressing apparent election fraud that have come it light recently around absentee ballots, streamlining the voter registration process, expanding early voting, and making sure that North Carolinians can exercise their right to vote.